1917, Italy. Australian journalist Rebecca Quinn is an unconventional woman. At the height of World War I, she has given up the safety of her Sydney home for the bloody battlefields of Europe, following her journalist husband to the frontline as a war correspondent in Italy. Reporting the horrors of the Italian campaign, Rebecca finds herself thrown together with American-born Italian photographer Alessandro Panucci, and soon discovers another battleground every bit as dangerous and unpredictable: the human heart. A passionate and poignant love story set on the beautiful Italian coast by the bestselling author of THE SOLDIER'S WIFE and THE WAR BRIDE. 4.0 out of 5 starsWar is a terrible part of the worlds history but it’s a story that needed to be told. A beautiful heartbreaking story about the heroes of the war, the men and women who supported behind the scenes and the brave who reported it. During a time when women’s rights were still a foreign concept in Italy Rebecca Quinn faced it all and all without her husband (who left her with little to no notice to go off chasing a story). I felt for her and cringed while she faced judgement from the men who still believed that women should just go tend their houses, my heart cried out for Sandro who I loved right until the final pages, my anger at Jack for leaving Rebecca to become so incredibly independent in a world that rejected such independence didn’t sit well with me and his betrayal of her trust was just the last straw. Rebecca showed that despite the fear and rejection she faced that she could still hold it together when it counted and could be courageous in the face of dangers that most women today wouldn’t imagine leaving themselves in a position to experience. An incredibly inspiring character and a story that melted my heart and gave me a new opinion of war themed books. Many thanks to Hachette Publishers for the opportunity to read this Advanced Review Copy. A Letter From Italy was the perfect way for me to pop my Pamela Hart cherry! This book was inspired by the first female war correspondent, and what a story it is. It is a sweeping, beautiful, emotional story that does wonderful justice for a part of history that for the most part has been swept under the carpet (I am not ashamed to admit that I did not know of Louise Mack and what she did). Rebecca's story is one that I am sure could be told hundreds of times over - the loving and supportive wife following the husband wherever he goes, keeping quiet and doing as he expects. Instead she is vocal on her career, her marriage, her expectations in life - and I loved her for it. This story shows how far we have come in the past century, but also highlights how far we still need to go. The story is intriguing, enlightening, action packed and full of passion. I really think that A Letter From Italy would make a wonderful movie or mini series - someone needs to get onto that pronto! Now I am going to go back and read Ms Hart's other works, and look forward to what she brings us next. This is another great historical WWI-era romance from Pamela Hart, following The Soldier's Wife and The War Bride (both excellent reads), although the story is totally independent. I like that the heroine is strong and feisty in a role which was traditionally seen as a man's (war journalist) and in a setting which is fraught with the tensions of being in the middle of an active war arena. The plot is excellent and as always, Pamela's detailed research brings the era to life. I would have liked the ending to be drawn out a bit more (but then I always want a good book to go a bit longer!). This is a moving story, a story of courage and strength the story of an Australian female journalist who arrives in Italy during World War 1 with her journalist husband and takes on the men and makes a mark in the world for herself and for females it shows how love can grow to such strength during times of intrigue and espionage of rations and hurt and heartbreak. When journalist Rebecca Quinn is left alone in an Italian village while her husband is off chasing a story she now sees her chance to get off the woman’s pages of the paper and become a war correspondent, this takes a lot of courage to stand up to the men and the ways of the world. Rebecca is alone but knows the other journalists there and having meals at Nonna Rosa’s Trattoria brings her into contact with photographer Alessandro Panucci which starts a journey through some very rough paths and feelings that must be kept close to her heart. Alessandro Panucci is an American born Italian he has come to Italy to try and do his bit for the war seeing as he can’t enlist in either countries he does what he knows best photographs and with a little push from his Nonna and Rebecca they join together as a team to make a couple of war correspondents who become very close in so many ways friends first but love grows as well, but this is a forbidden love. This is my first story by MS Hart and won’t be my last beautifully written it pulled me in from the first page so much happening the setting is gorgeous the hardships of wartime and the tragedies that people go through and the descriptions of Sandro’s photos were so real it was like I was looking at them. And of course the moving love story that bought me to tears and then tears of joy at the end wartime brings so much heartache but there is always a shining light. Thank you for a fabulous story. 5.0 out of 5 starsA seriously great story! A Letter from Italy kept my attention right through. As with any excellent book, the further I progressed, the harder it was to put down. It was like the characters were waiting for me to get back to reading so they could get on with their very real lives. 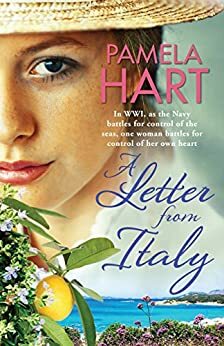 Pamela Hart brought wartime (WWI) Italy to life. I felt it. I smelt it. I saw it. I even tasted the coffee. Every good book can grow the reader a little chink at a time. This one has changed me because I've learnt a bit more about history and that helps me grow roots in where I fit in my time. Just loved it. Full review to follow as a Manview on my blog Deanna's World, but wanted to say I greatly enjoy the depth of this book on women's issues and Hart's descriptive abilities. Reading this book is more like watching a movie than just reading the book. I have clearly visualized every scene, movement and heard every spoken statement. Hart's ability to describe scenes, characters, relationships, issues, etc. exceed's the abilities of most other authors I have read. A great read. 5.0 out of 5 starsBrilliant historical fiction! When Australian journalist Rebecca Quinn’s husband Jack announced he was leaving – in an hour no less – to sail with the smugglers while chasing a good story, she was shocked. She had arrived in Italy with Jack as a war correspondent, supplying letters to newspapers in Britain and Australia – she certainly hadn’t expected to be left alone in a city where she knew no one and hardly spoke the language. But Rebecca was a strong and independent young woman – she wasn’t prepared to head back to Australia with her tail between her legs; she would be the correspondent she had always wanted to be. As Rebecca and Sandro were thrust closer to the front lines, danger loomed all around them. Would they make it through? The adrenalin and excitement of getting a good story was foremost in their minds – what would be the outcome for two people who knew the future wasn’t theirs? 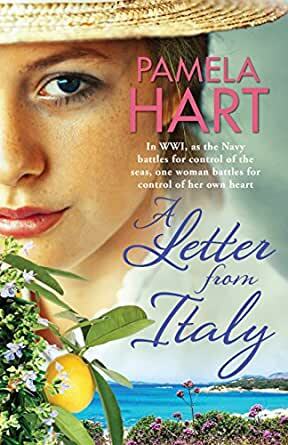 A Letter from Italy by Aussie author Pamela Hart was utterly brilliant! Fast paced, original, heart breaking and real, the beauty of the Italian coastline was marred by war, but when viewed through Sandro’s camera lens it came to life. Captivating and poignant, I loved Nonna Rosa’s acerbic tongue which covered a heart of gold – also the children who were so eager to help for a coin. Pamela Hart is fast becoming one of my favourite historical fiction writers. Highly recommended.